her as a Czech language teacher." www.czech.cz Czech.cz: Official site for the Czech Republic; it functions as a guide to the country and its people, institutions, culture, and history. www.czechsite.com Czech site: Travel guide for your trip to Prague and the Czech Republic. Online accommodation (hotel, hostel) reservation. www.czech-tourism.com Czech Tourism: Tourism information. www.czech-vacations.com Tatra Travel: This travel agency offers airfare and travel packages to Prague and other destinations in Central and Eastern Europe for reasonable prices. I highly recommend buying plane tickets to Prague from them. www.myczechrepublic.com My Czech Republic: This site is dedicated to Czech life, culture and travel. 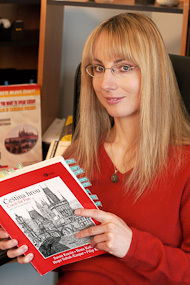 It is a source of first-hand information about the Czech Republic. It offers a guide to Prague with original articles and sightseeing tours, practical travel information and tips, personable columns, news, trivia, photos, active message boards, and more. www.locallingo.com Local Lingo: This is an extensive Czech language resource including an audio pronunciation guide, grammar overview, phrases, vocabulary and online exercises. From travel phrases to grammar instruction and message boards, Local Lingo is a perfect destination for travelers. www.centraleurope.com/czechtoday EIN News: Czech news, constantly updated news and information about the Czech Republic. www.atlas.cz Atlas.cz: Czech search engine. www.seznam.cz Seznam.cz: Czech search engine. www.tradenet.cz AA TRADENET Global Trade Information Network: It provides free useful information about trade opportunities worldwide. www.ctg.cz Czech Travel Guide: This site provides lodging, transportation, entertainment, sports, and cultural information. www.crr.cz CRR: Center for regional development of the Czech Republic. www.psp.cz Parliament of Czech Republic. www.senat.cz Senate of the Czech Republic. www.hrad.cz Hrad.cz: Office of the Czech President, information on the Czech President and Prague Castle. www.cuni.cz Charles University: This is the oldest university in Central Europe. www.cvut.cz Czech Technical University in Prague. www.praguefinedining.cz Zatisi Catering Group: This is one of the leading fine dining companies in the Czech Republic. It operates three restaurants in the historic center of Prague in addition to its catering business. www.imagetheatre.cz Image Theater: Image Theatre is a result of the Czech traditions of Black Theatre, which combines dance, music, and pantomime to tell an exciting story. www.globebookstore.cz The Globe Bookstore in Prague. lava.ds.arch.tue.nl/gallery/praha/tgehry.html The Dancing Building in Prague. www.prague-tribune.cz The Prague Tribune Magazine. www.radio.cz Radio Prague: The international service of Czech Radio, international broadcast station for the Czech Republic, offers Czech news in English, Czech, German, Spanish, French, and Russian. users.ox.ac.uk/~tayl0010/transl.html Czech and Slovak literature in English. www2.arts.gla.ac.uk/Slavonic/staff/Czech_literature.html Czech Literature and the Reading Public: Lecture given at the University of Glasgow. Igor Hajek, Memorial Conference, 26th November 1995.
www2.arts.gla.ac.uk/Slavonic/staff/Holy.html Czech literature since the 1980s. www.oneworld.cz One World International Human Rights Film Festival. www.iffkv.cz Karlovy Vary International Film Festival. www.rootsweb.com/~czewgw Czech Republic Genealogy website.